Catchy themes has been purchased 16, rating: 4/5 based on 4 reviews. 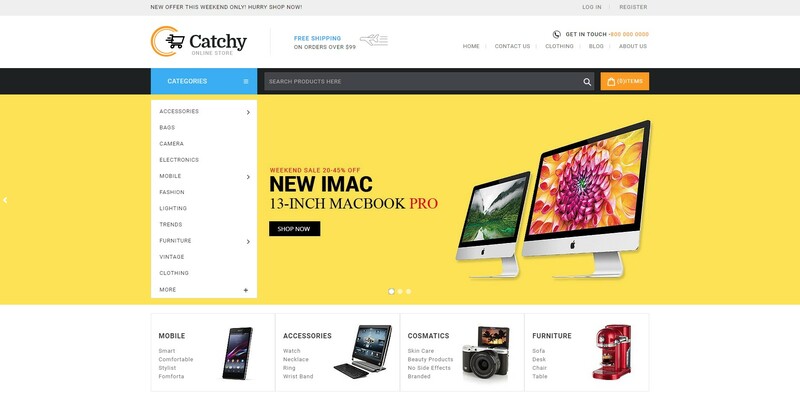 Catchy Shopify Theme is a beautiful and unique design that fits in all the different stores like electronics, mobile phones, computers, food, furniture, toys, cars, books, etc. This theme has the perfect combination of color and composition that draws customers at first sight. In addition, Catchy Shopify Theme includes a flexible control panel that makes online shopkeepers easier and more efficient. Another great point, this theme comes with tons of powerful modules to help your shop to be perfect.